This 1/2 carat diamond solitaire engagement ring from Apples of Gold Jewelry is set with a quality, H Color, SI2 Clarity diamond that is white and shines brilliantly. When shopping for diamonds, be sure to check the quality ratings on the diamonds. You can find a cheaper diamond, but it will not be as white or brilliant as this one. And when it comes to something like your wedding ring, you want a solitaire ring that will be a blessing all of our married life. 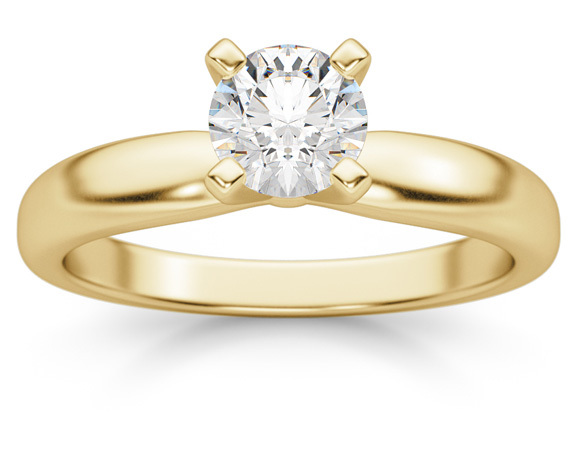 This 1/2 carat diamond solitaire ring from Apples of Gold is that ring! Also available in 14K White Gold and other carat sizes. Apples of Gold Jewelry guarantees the 0.50 Carat Round Diamond Solitaire Ring, 14K Yellow Gold to be of high quality and an authentic engagement ring with real diamonds, as described above.